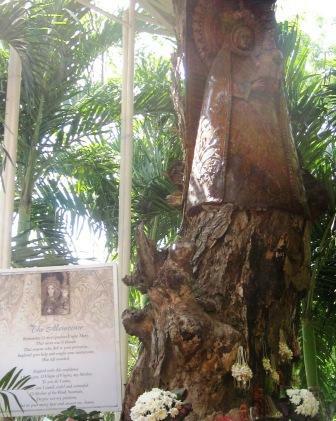 I have always been a devotee of Our Lady of Manaoag. Ever since I was a child, my mom and my relatives would always set a pilgrimage to her shrine in Pangasinan once in awhile. She has granted my numerous petitions through the years. I remember when my husband and I were not yet a couple, I asked her to give me signs if he (my husband) is the right one for me. I told her, I would marry someone who will always sing for me, because I really adore men with good voices. My husband loves to sing, and he sings just right. I told myself, it might be just a coincidence. And secondly, I said, if I will see three lighthouses while I am with him before the year ends, then he is the one. To my delight, she showed me three lighthouses before Christmas Day. One is when we went to Bohol. 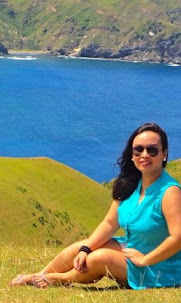 Little did I know that the first stop of our countryside tour is the lighthouse in Baclayon, where the actor Cesar Montano proposed to his wife, Sunshine Cruz. When we went to a resort in Pangasinan that same year, as we were settling in a cottage at the second floor, I opened his camera to take a photo of the Sual hillside. As I was zooming in, I was surprised to see a lighthouse! I did not tell him about my prayer that time. When we went to Cebu, I know I will see the third lighthouse in Liloan. I never realized that Liloan is far from Mactan, where we plan to spend most of our vacation. In short, I did not see the third lighthouse. But even before I see the third lighthouse, my husband proposed to me in an Island. So I told myself, perhaps, it’s not the right time yet. While onboard a plane going back to Manila, I was on a window seat. My hubby was sleeping and I was watching the clouds from the window. I can still see some islands. To my astonishment, I saw something white in one of the islands. I grabbed our camera and zoomed in and there, I saw the final lighthouse! I woke him up and pointed at the lighthouse. He was confused and didn’t understand why I was so bedazzled. I explained everything and he laughed and told me, have he known this all the while, he should have brought me to all the lighthouses he is familiar with. About 2 months after, we got married. 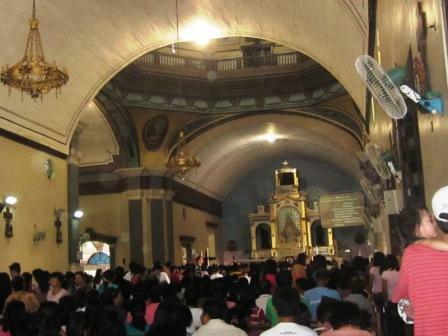 This is yet another blessing of Our Lady of Manaoag. Another instance is when I got pregnant with our first baby, which turned out to be an ectopic pregnancy. Two months after my salpingectomy, we applied for work in Canada. I asked her; if she wants us to leave the country, let it be. But if she doesn’t, please bless me with another baby ( I was too afraid I might not get pregnant again because I only have 1 fallopian tube). In less than a month, I conceived and gave birth to a healthy baby girl thereafter. 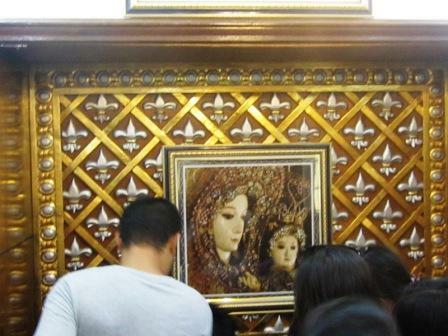 Now, you could just imagine how strong my devotion is to Our Lady of Manaoag. That also explains why I see to it that I visit her shrine once a year. 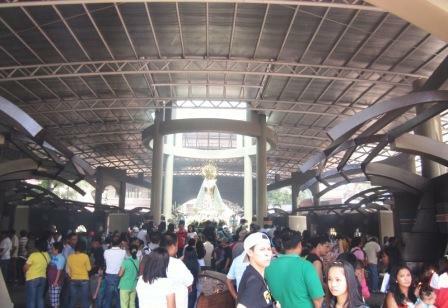 This Holy Week, I went again to her shrine on Good Friday. 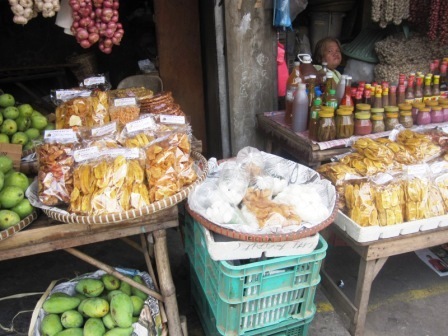 To go there, you can take a bus from Cubao or Pasay going to Dagupan. 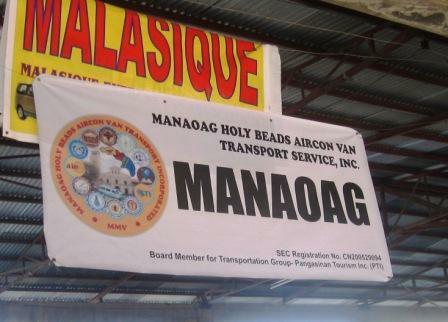 Sometimes, there are buses with a signboard saying “Manaoag”. I am not sure though if this will be drop you off in front of the church. From Dagupan, take a van to Manaoag. The terminal is just a few steps away from Victory Liner Terminal. 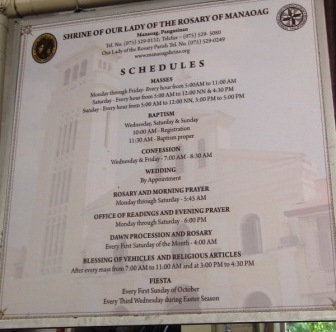 Fare is Php 30 per head and travel time from Dagupan to Manaoag Shrine is about 1 hour. 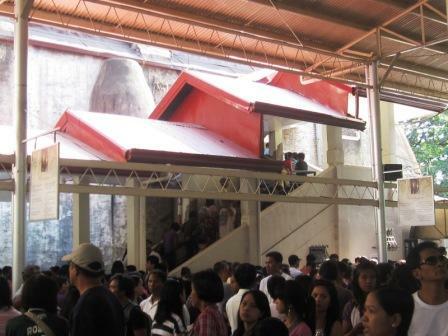 Since the shrine’s peak season is in April and May, you could just imagine the number of devotees there on Good Friday. I don’t mind this. 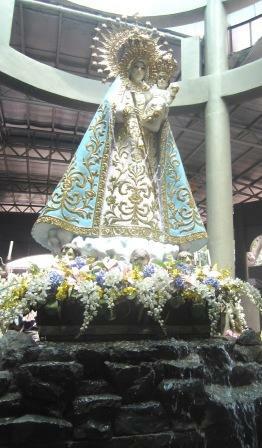 In fat I am happy to see that a ot of people also believes and adores Our Lady of Manaoag like me. We went up to the Veneration Room to touch her cape and say a prayer. We also lighted candles in her new candle sanctuary where a replica of the lady stands in the middle of a man-made falls. 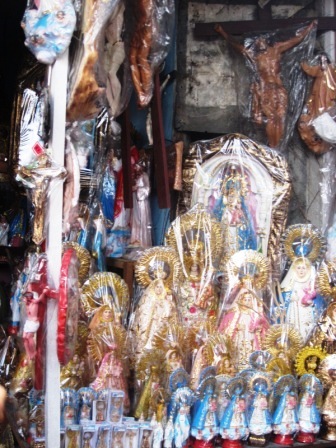 There are also lots of stores beside the church selling religious items, delicacies like puto calasiao, tupig, bukayo and patupat. As I write this post, I am proud to say that she bestowed another miracle on me, as she saved me again with another ectopic pregnancy. 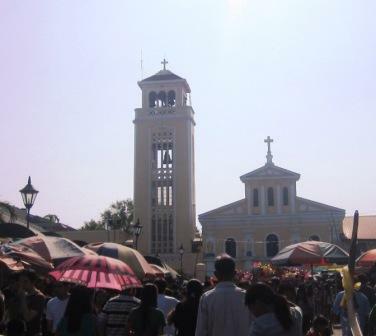 Your truly blessed..me and my husband also visit Our Lady of Manaoag November 30, 2015..were praying deeply to Our Lady of Manaoag for a baby..were married for 3yrs..hoping that she will grant our prayer to have a baby..